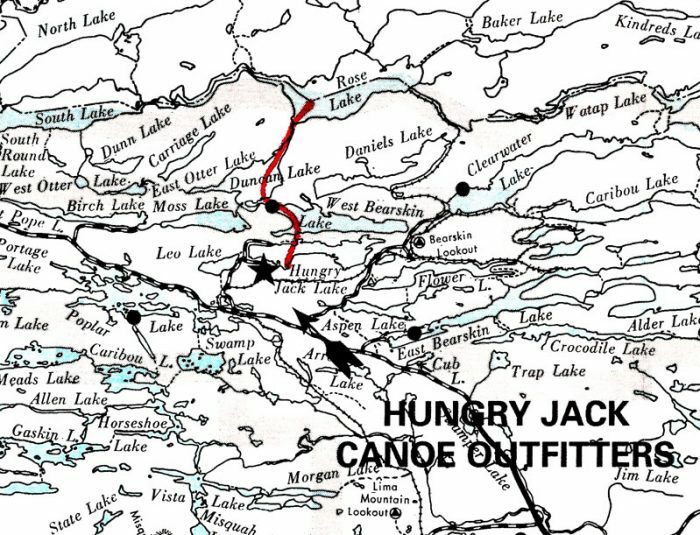 Hungry Jack Lake to Rose Lake, 3 to 5 days. 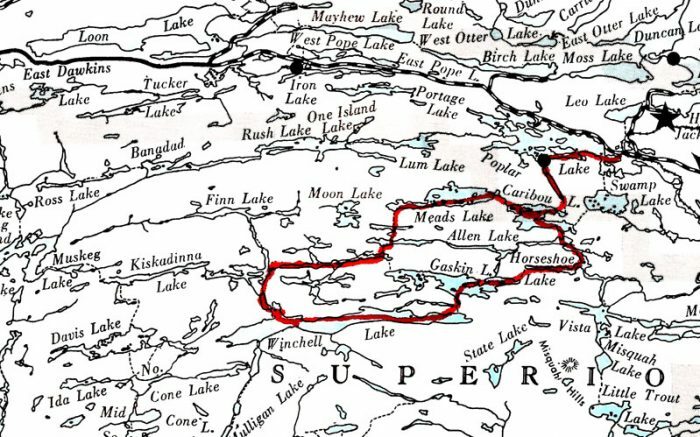 Start at our dock and head for the Canadian border though Bearskin and Duncan lakes, over historic Stairway Portage and into Rose Lake. There you can set up a base camp and then travel without taking gear along (good with children). 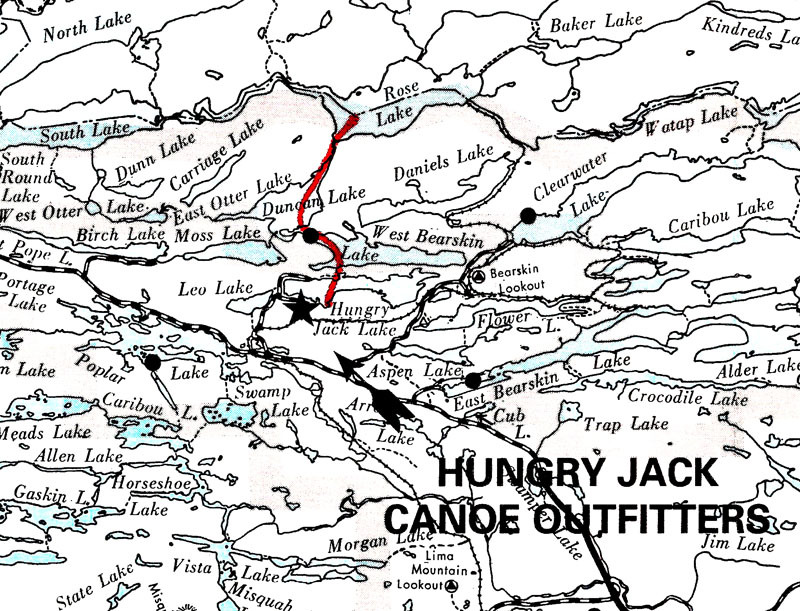 Or you can paddle along the border moving each day, and return on your last day to Hungry Jack. Highlights Spectacular cliffs and bluffs, hiking trails, bass and lake-trout fishing. Great fall colors late in September. 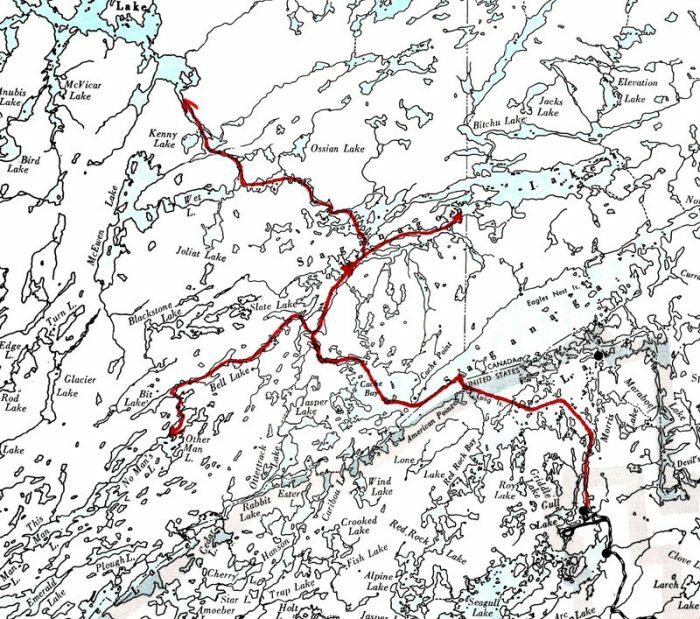 Clearwater Lake to Daniels Lake, 3 to 5 days. Start at Clearwater Lake and spend your first night on one of the most scenic lakes in the BWCAW. Then travel to Caribou Lake or Watap Lake for great smallmouth-bass action. There are also some easier sections of the Border Route Trail that you can hike to beautiful overlooks. Move on to Daniels Lake for your last night, for more great fishing and a quiet setting. Paddle out to our dock on your last day. Highlights Old growth-pines, high cliffs, and great bass fishing. 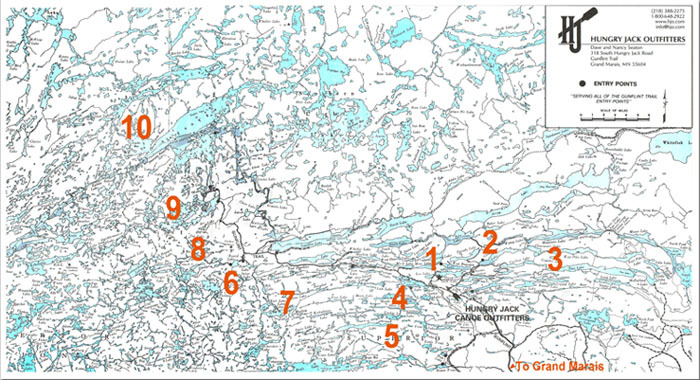 East Bearskin Lake area, 3 to 6 days. Several lakes make good base camps for an easy first trip, or for those who want to concentrate on fishing. Or you can do a longer loop through Pine Lake and the Pike lakes, returning through Clearwater Lake if you want to travel more. Highlights Both routes offer beautiful pine-rimmed lakes, good fishing for walleye and bass, and varying degrees of difficulty. 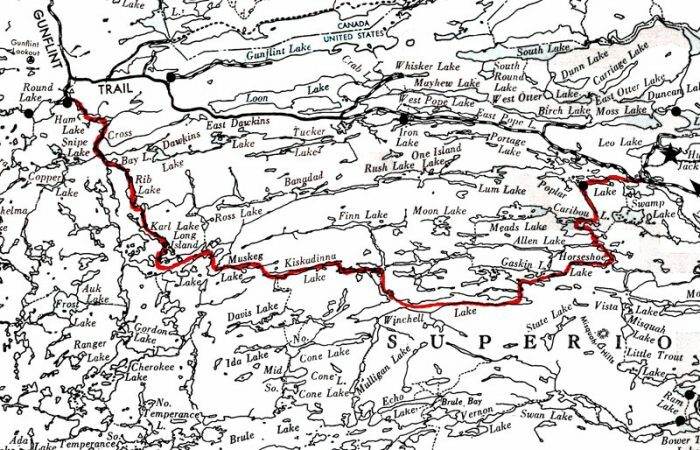 Poplar Lake to Gaskin Lake, 3 to 5 days. Another easier trip for people who want to concentrate on fishing or daily adventure from a base camp. This area is well suited to a nice, small loop trip with short moves each day (good with children). Many lakes offer good base-camp locations, depending on your specific interest. Highlights Beautiful pines and lots of moose and other wildlife. Easier portages throughout the area, with little overall elevation change. Good walleye, northern-pike, and bass fishing. 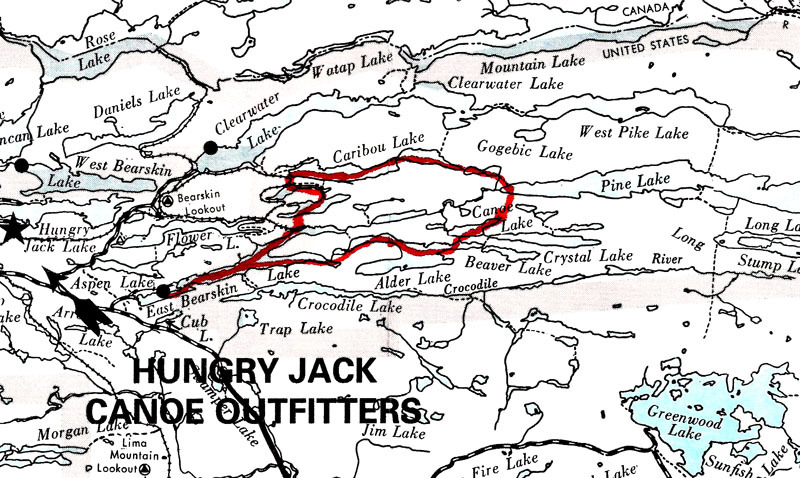 Bower Trout Lake to Poplar Lake, 4 to 7 days. This is a very lightly traveled area, with small lakes and very few campsites — ideal for those who want to be alone. More rugged portages than other areas, but worth the effort. 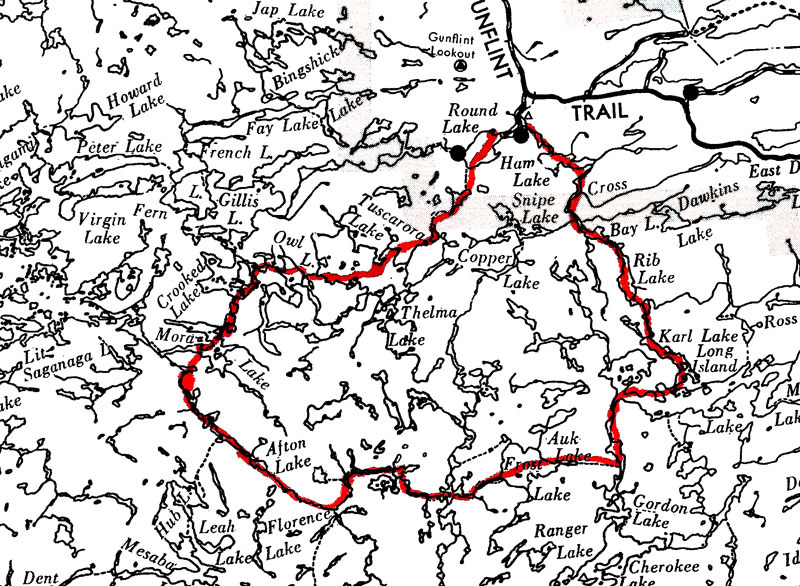 Highlights Good moose-viewing area; good fishing for walleye and northern pike. Cross Bay Lake to Long Island Lake, 3 to 5 days. An easy trip for beginners or families, featuring a variety of scenery. Long Island Lake has good sites for a base camp, allowing your group to take day trips in the area. Fishing for northern pike and lake trout. Highlights Lowland area with unique plant life and a good variety of animals, including many moose. There are some island campsites available. Ham Lake to Poplar Lake, 5 to 8 days. 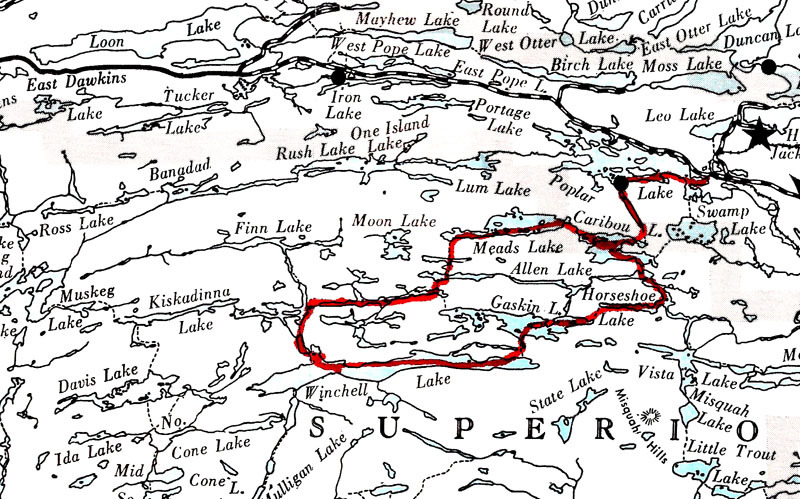 Start at Ham Lake and travel through smaller, narrower lakes to the east back to Poplar Lake. You will see a wide variety of landscapes. Highlights A good area for viewing wildlife, easier portages overall, and a full variety of fishing options. Cover new territory each day you travel on this loop trip, and also have time to kick back for a day or two. The Frost River, 5 to 8 days. 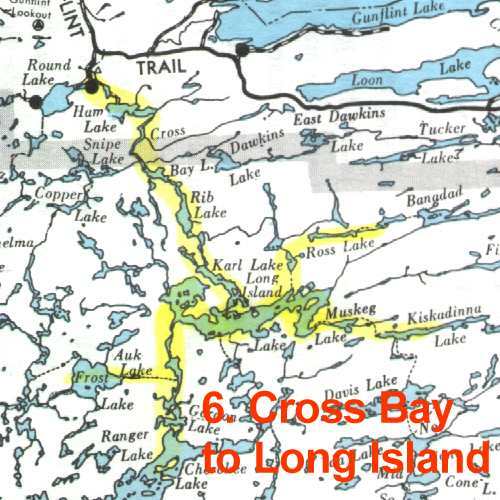 Start on Cross Bay Lake and turn west at Long Island Lake into Frost Lake, follow the river for a day or two and come out through Little Saganaga and finally Round Lake. The Frost is one of the few navigable streams in this area of the BWCAW. Many short portages and a few long ones through a unique section of the Boundary Waters. Highlights A great area to see animals and few people, but you do have to work for it. This route is best in spring, when the water is high. Seagull Lake to Round Lake, 5 to 8 days. Start on Seagull and travel west through Alpine and Ogishkemuncie Lake, then south through a chain of ponds linked by waterfalls, then east back to Round Lake through many smaller lakes. Highlights There are many alternatives routes through this area. Good fishing for all species of fish along the way. More rugged terrain and exposed rock. The Falls Chain, with roaring waterfalls and rapids along the way to Kawnipi Lake. The Man Chain, with clear, emerald-green lakes and rugged country. And Lake Saganagons base camps just past Silver Falls for the best fishing to be found in these parts. Highlights Quetico is more rugged and primitive than the BWCAW, but the rewards are worth the effort. 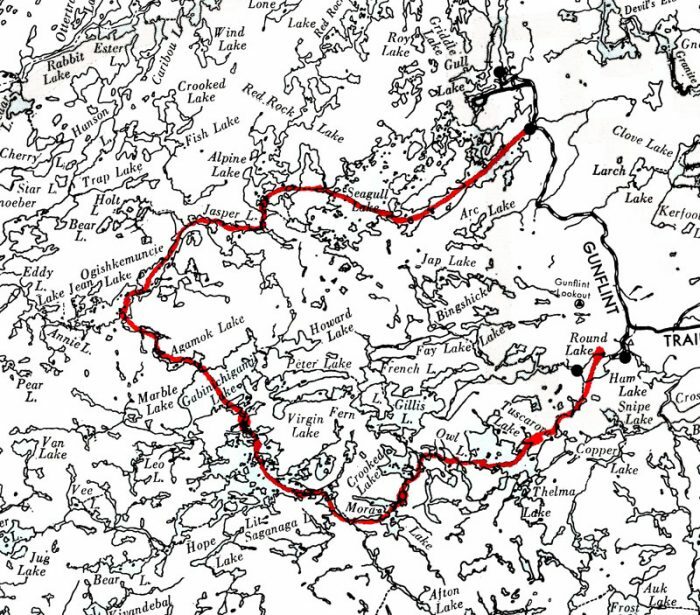 Far less use is allowed than in the BWCAW, and therefore it is harder to get a permit. Call us to discuss which route is right for you or to get more suggestions.